Hawaii is paradise for so many active travelers, offering zip-lining, golfing, hiking, snorkeling and a wealth of other outdoor pursuits. Hawaii has long held a reputation as a waterman’s paradise, with waves perfect for surfing, boogie boarding and paddle boarding. But you don’t need to take to the waves to appreciate all that these islands have to offer. Tie on hiking boots, don a snorkel mask or book a whale-watching tour and you’ll witness the other sides of this multi-faceted destination. Read on for our top picks for the best things to do in Hawaii. Hawaii’s lush mountains, green and dripping with waterfalls, beg to be explored. 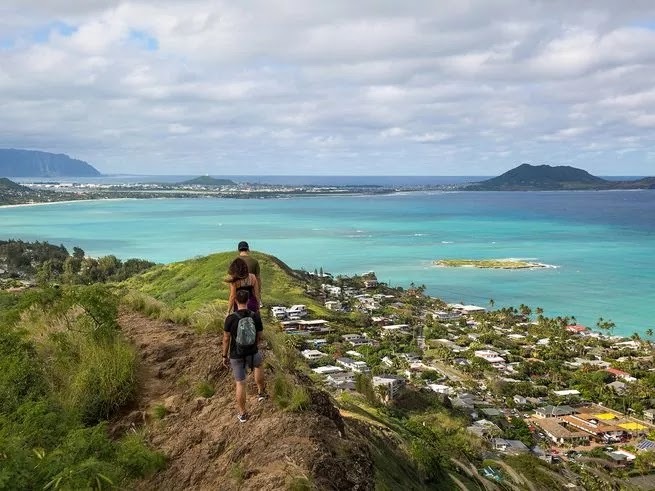 If you’re looking for a breezy day hike to do in tennies, Hawaii has that, with easy routes such as the Kaiwa Ridge Trail (also called the Lanikai Pillbox hike) on Oahu. 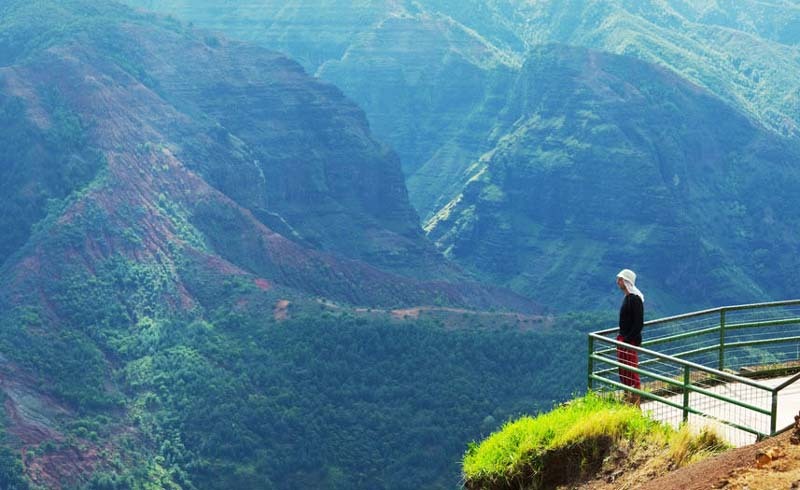 Or, if you’re more daring and experienced, you can tackle some of the more epic hikes, such as Pali Notches, also on Oahu, where hikers thread along a ridgeline to encounter some of the best summit views to be had in a tropical setting. With backdrops of the deep blue Pacific as well as rainforest-covered mountains, views while zip-lining in Hawaii aren’t to be missed. On Maui, one of our favorites is CLIMB Works Keana Farms on the North Shore for the fact that their eight zip-lines offer riders a side-by-side experience, and for the fact that the site doubles as a working Hawaiian farm. Just like much of the West Coast mainland population, humpback whales love to winter in Hawaii — but unlike most visitors, they stay from December through March. Several Hawaiian Islands offer boat tours to see this majestic animal. A few of our favorite whale-watching tours are Wild Side Specialty Tours on Oahu and Captain Dan McSweeney’s Whale Watching Adventures on Hawaii’s Big Island. We know, we know: it’s your Hawaii vacation and getting up to watch the sunrise probably isn’t on the top of your priority list. But if there’s one time to do it, this is it. 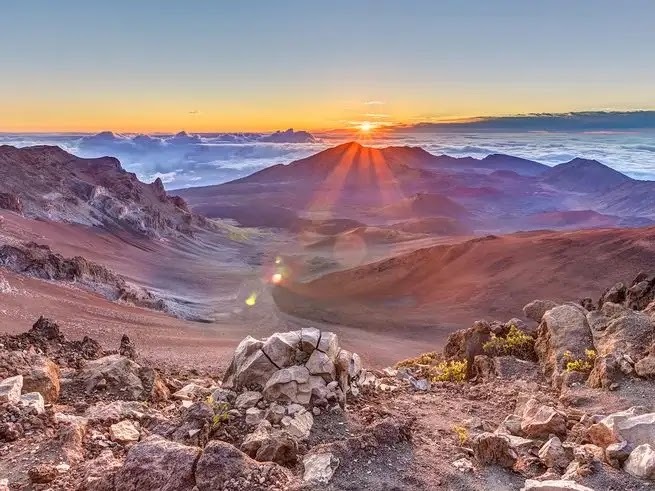 Watching the sunrise at Haleakala National Park is one of the top things to do on Maui, but reservations are limited to 150 per day. Secure a spot by booking a bike tour, and daybreak is just the beginning of the adventure, one that culminates with a 26-mile bike ride down the mountain. Several tour companies offer round-trip transportation from most hotel areas. Beginners should opt for a group tour (with the option to ride in a van if the trek becomes too strenuous), while the more advanced can choose a self-guided tour to ride at their own pace. Located on Oahu, One of the most powerful war memorials in the country, Pearl Harbor’s U.S.S. Arizona Memorial and the World War II Valor in the Pacific National Monument honor the 1,777 souls lost on December 7, 1941, when Japan bombed the U.S.S. Arizona. The ship sank almost instantly to a depth of less than 40 feet. Visitors to the Arizona gain a rare window into this underwater tomb, and can make a day of it with the nearby U.S.S. Bowfin Submarine Museum and Park, as well as the Pearl Harbor Aviation Museum. Putting on a mask and fins and cruising overtop Hawaii’s hard corals and alongside its massive population of green sea turtles are experiences not to be missed. What’s more, the fish here are unlike those you will find anywhere else — literally. One-fifth of them are endemic, that is, existing only in Hawaii thanks to the evolution that occurred at this isolated outpost destination. Of all Hawaii’s reef fish, the wrasses are our favorites for their insane, bright colorings. Just take a peek at the psychedelic wrasse, whose orange face features iridescent turquoise spots. One look and you can’t help but be amazed at Mother Nature’s gaudy color palette. 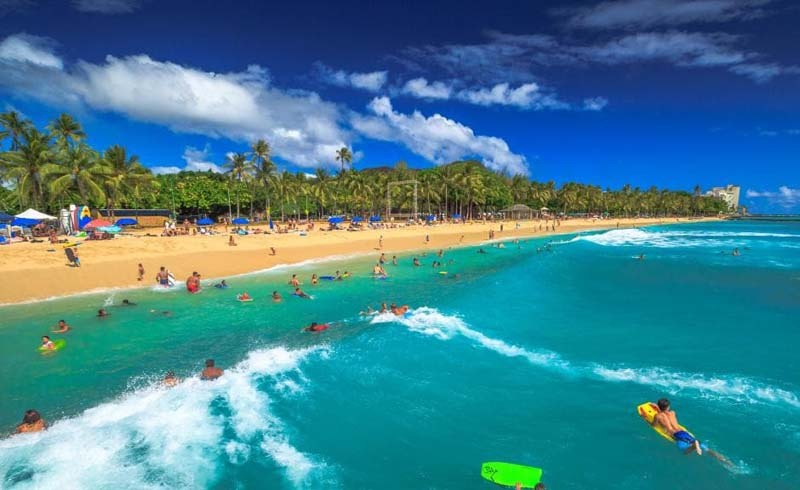 As to where to go, read more about the best places for snorkeling in Hawaii. For the chance to see active lava flows, plan a visit to Hawaii Volcanoes National Park on Hawaii’s Big Island. With the volcano eruption in May 2018, lava flow in the park is scarce or non-existent, but check in with the park’s Kilauea Visitor Center, then plan hikes and drives accordingly. Steam vents and craters can still be viewed, although some parts of the park were still closed at press time. Alternately, a biking tour that covers more ground in a fun, sporty way, consider the half- or full-day tours offered by Volcano Bike Tours. Or plan a drive along the Chain of Craters Road stopping along the way at lookout points to see volcanic craters, lava rock, and eventually ending at the ocean. Oahu has the longest list of golf courses, both public and private, totaling 40. Hawaii’s Big Island comes in second, offering 17 golf courses, three of which are private. Maui packs 10, and Kauai clocks in with eight. 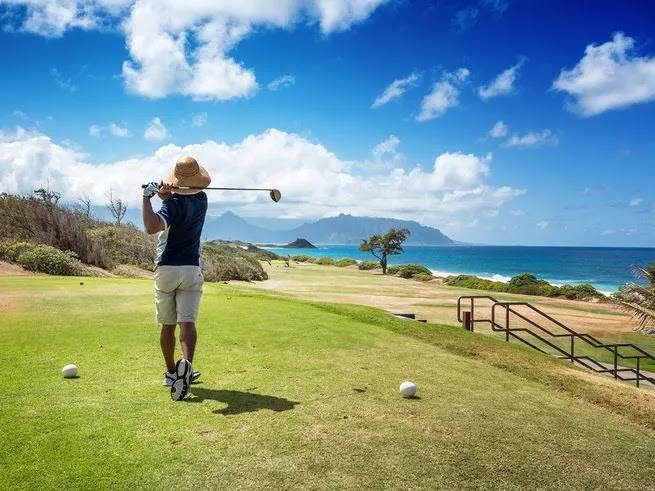 However, Kauai is home to several of the most beloved courses for golfing in Hawaii, with Princeville Golf, part of the Princeville Resort Kauai, scoring top honors for its seamless design that incorporates the island terrain, making for a challenging and breathtakingly scenic experience. Yes, we already listed snorkeling, but this is hands-down one of the best things to do in Hawaii — even if all you do is ride the boat to the site and watch from above as a dozen or more reef mantas careen around underwater. Scuba divers flock to Hawaii’s Big Island, as it is the only place on the planet that has almost guaranteed nightly sightings of these animals so close to shore. But we love the fact that even beginner snorkelers can have this experience, as can scuba divers who hold a night-diving certification. Honeymooners or any other traveler looking to add excitement and an unforgettable experience to their Hawaii vacation should consider a helicopter tour. Blue Hawaiian Helicopters is one of the oldest and most established companies, and they operate out of the Big Island, Oahu, Maui and Kauai. Our top pick for a helicopter tour is Kauai, where visitors can gape at the green, sheer mountain walls of the Na Pali Coast — with very little of it accessible by car or foot. Witness it firsthand and you’ll see why it’s one of the most beguiling sights in all of Hawaii.